We are a not-for-profit recycling company. Our remit is to provide support to the homeless, the unemployed and those facing hardship by way of accommodation, food, education and direction. We achieve this through various fund raising activities and through donations and support from companies and individuals. If you would like to learn more or help with donations, please explore our web site or contact us. 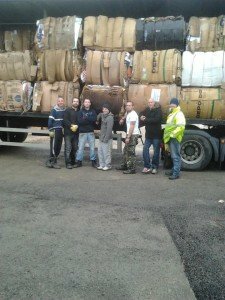 Recycling – Our aim is to find a use for all the items we collect reducing the amount of waste going into landfill. Volunteering Opportunities – are created by Change Aid Ltd for unemployed individuals. Participating in these activities gives young people experience in a working environment, a reference for future job applications and a chance to be a part or our organisation. We are currently working towards being able to provide our volunteers with an accredited qualification. Surplus Funds – Any profits made are currently used to grow and expand Change Aid Ltd, any surplus income generated will be used to support our associated registered charity the CAL Centre. The CAL Centre Project is a charity that has been set up to establish smaller projects aimed at providing support, advice, sign posting and training within a small, friendly and welcoming environment. We are very grateful for all donations to our organization no matter how small. Every penny counts. Thank you for your continued support.